Staples® Gift Cards - Easy for you. Perfect for them. Really want to give them something they'll appreciate? Staples gift cards are the perfect choice. From laptops and tablets, to business essentials and more, there's something here for everyone. Visit staples.ca to find the store nearest you. Order your bulk Staples Canada gift cards from NGC Canada today! PROTECT THIS CARD LIKE CASH! 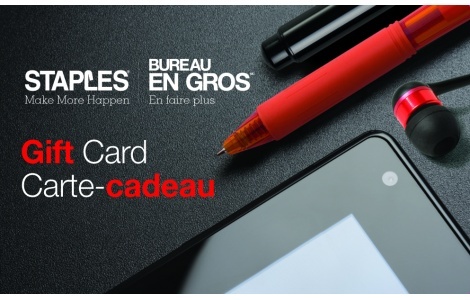 Gift Card Terms and Conditions: Card redeemable for merchandise & services only at STAPLES and BUREAU EN GROS retail stores in Canada. Cannot be exchanged for cash or used for credit card payment. If lost, stolen or damaged, present required proof of purchase (or damaged card) at a Canadian STAPLES or BUREAU EN GROS store and a replacement card with the balance at time of deactivation will be sent to you. Terms and Conditions subject to change without notice. Card has no value until activated. Once activated, protect this card like cash; can be reloaded at any of our retail locations in Canada. For balance inquiries and questions please call 1-877-635-7704 or visit any of our retail locations in Canada.